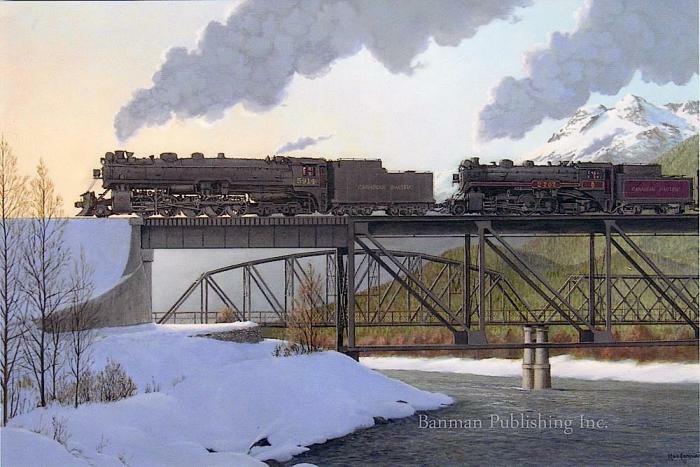 Image Size: 9" x 6" Framed Size: 14" x 11" On a clear winter morning a train rumbles across the 1100 foot bridge on the Columbia River towards Revelstoke and a change of engines and crews before proceeds eastwards on the Mountain subdivision. The leading engine, Selkirk 5914, is returning to base after assisting a westbound to Taft in Eagle pass while Pacific 2707 will be serviced and readied for another trip to Vancouver. The single lane road bridge in the background is still in use while the railway bridge has since been replaced.